OPEN CANCELLED. NOTHING TO DO BUT MOVE IN! Nestled At The End Of A Quiet Cul-De-Sac W/ Spacious Front Yard, This Over 1,700 SqFt PENFIELD Home Has 4 Beds, 1.5 Baths & UPGRADES GALORE! Living & Dining Rooms Are Highlighted By Beaming Hardwood Floors, Bright Bay Window & 2018 UPDATED Wood Burning Fireplace. Kitchen Has Stainless Steel Appliances, NEW CORIAN COUNTERS/Sink, NEW Tile Back Splash & Room For Island/Eat In. MODERN FULL BATH Boasts Updated Flooring, Vanity, Shower, Fixtures & More. Cozy Family Room & 4th Bedroom W/ Newer Carpet. 1/2 Bath & Laundry Room Downstairs W/ NEW TILE Flooring. 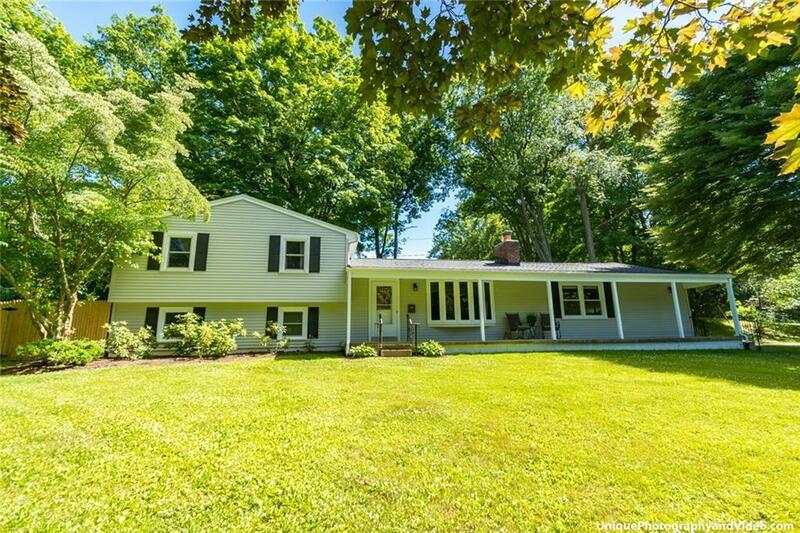 Slider Brings You To Wooded, Private & Fully Fenced Back Yard W/ Drainage System & Patio! BRAND NEW, TEAR OFF ROOF 2017, NEW SIDING 2016, ALL NEW WINDOWS 2011, NEW ELECTRIC, A/C & HOT WATER HEATER. New Block Windows! LAWN MOWER, SNOW BLOWER & YARD SWEEPER INCLUDED! Directions To Property: Take Five Mile Line Road To Sawmill Drive. House Will Be On Your Left.